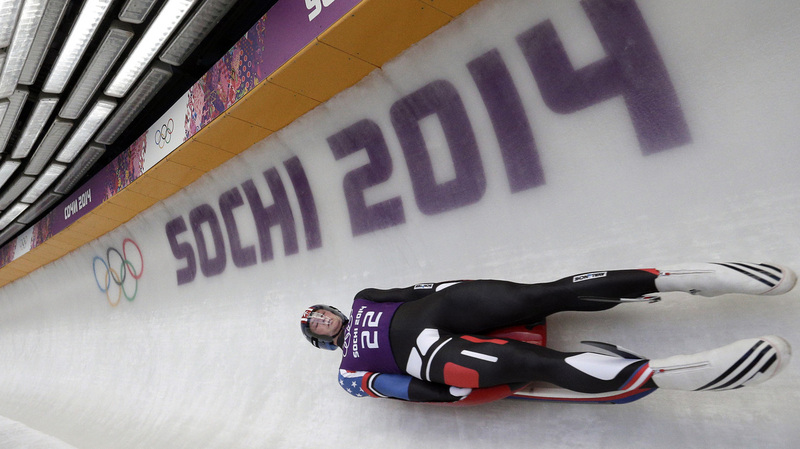 USA Luge Holds Slider Searches To Find Next Generation Of Competitors USA Luge is looking for competitors to hop in those sleds and rip down icy tracks at about 90 miles an hour. It is throwing regional events to find new, young talent. Aiden Kelly trains for the men's singles luge at the 2014 Winter Olympics on Feb. 7, 2014, in Krasnaya Polyana, Russia. It isn't easy to find people to do luge, the sport that uses a tiny little sled to rip down an icy track at about 90 miles an hour. That's largely because there are only three places in the U.S. where you can try the real thing. USA Luge, the organization that recruits and trains athletes for international luge competitions, is looking for the next generation of competitors, and it's throwing regional events to find new talent. In the summer, they run sleds on wheels, racing down hilly pavement. In winter, there are practice tracks and races at ski slopes around the country. "Luge is one of those sports that you think about for like two weeks every four years," says Aiden Kelly, a veteran "slider," as luge racers are called, at 22. "It's a much bigger sport in Europe." Kelly started at 13 after he was picked out of a crowd of kids at one "slider search." "The Germans and Austrians and Italian fans over there probably keep us going a little more than our American fans do unfortunately, but I think everybody's always interested when they see it," he says. At a recent slider search at the Wachusett Mountain Ski Area in Massachusetts, participants used plastic replicas of the actual steel sleds. "We have a sled on display right here under the USA Luge tent," Kelly says. The track is different, too. It isn't a sheet of ice. It's more like a short tubing run, with walls carved out of snow, about 50 feet long. Real luge tracks can be up to a mile. That means there's not a whole lot of space here to judge prospective racers. But a lot of the people go up and down dozens of times, and it becomes easy to pick out the naturals. "I like it," says William Watson, 10. He sleds straight and fast. No fear. "I like the feeling of going fast when I'm on my back." Keep an eye out for William. He came in second in a competition later in the day in the 10-17 age group, earning himself a trip to Lake Placid, N.Y., for a real tryout — and a shot at the Winter Olympic Games.